Youtube tags are one of the key factors in ranking a Youtube video. 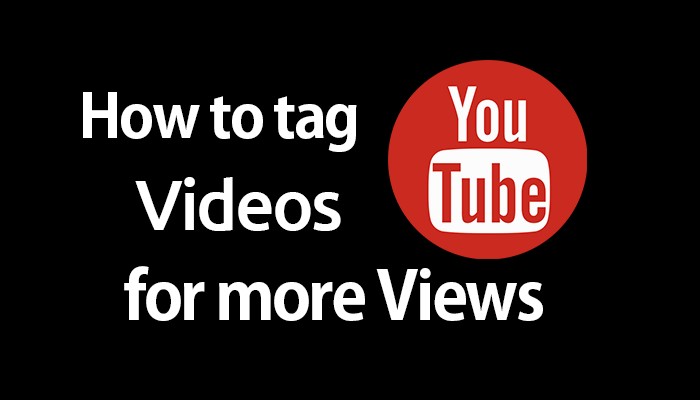 Do you know want to know how to tag youtube videos? If you’re an aspiring Youtuber, you must have heard or read at some point or the other that in order to get more views on youtube, you must learn to optimize youtube video tags. Tagging youtube videos correctly can lead you to the success. But if you avoid that part, you might find yourself struggling for getting youtube views for the endless time. In this tutorial, I’ll be telling you the correct way on how to tag your youtube videos. So if you are willing to get more views on your Youtube video, read this article till the end! Once you will go through this complete article, you will never ask “how to tag youtube videos”. But before we move further and check out how to tag a youtube video, I would like to illustrate a little more on Youtube tags, so that we can better understand the strategy for correct Youtube tagging. What are Youtube tags and Its Importance? Youtube tags are nothing but the keywords you insert in your youtube video description while uploading your videos! Youtube tags are part of the Youtube metadata along with video description and title. Taking care of Youtube tags is essential for proper Youtube Search engine optimization. Since youtube can’t read your video content, it’s the Youtube metadata that plays the key role in specifying to youtube that what your video is about. Depending upon the Youtube tags or keyword you have put in, Youtube rank your video for those particular keywords resulting more views on your video. According to the video tags only, a video shows up in the side bar of the similar suggested videos. So we need to tag youtube videos with utter cautiousness! However, you can’t just rely on Youtube tags for getting views but there are several other factors that need to be considered. But the role of effective Youtube tagging in getting more views is inevitable. Below, I’ve mentioned all the tips and tricks you need to know in order to tag youtube videos effectively. So now without any further ado, let’s move ahead and learn how to tag youtube videos! Now that you have understood how crucial Youtube tags are in Youtube SEO, let’s move further and check out some tips on how to tag youtube videos. For new and even for existing Youtubers, this tutorial is going to be a very handy resource. So read the tutorial very carefully and apply these tips in youtube video tagging to get the best results! Proper keyword research is the key factor of Search Engine Optimization whether it’s for google or Youtube. The proper meaning of keyword research is finding those keywords that people search on the Internet to reach out their desired results. The key agenda for keyword research is to brain storming for those keywords which have highest searches and low competition. If you manage to find set of such keywords, then you can use them as your youtube tags. One of the most used tools for keyword research is Google keyword planner. Many people think GKP as a tool for bloggers only. 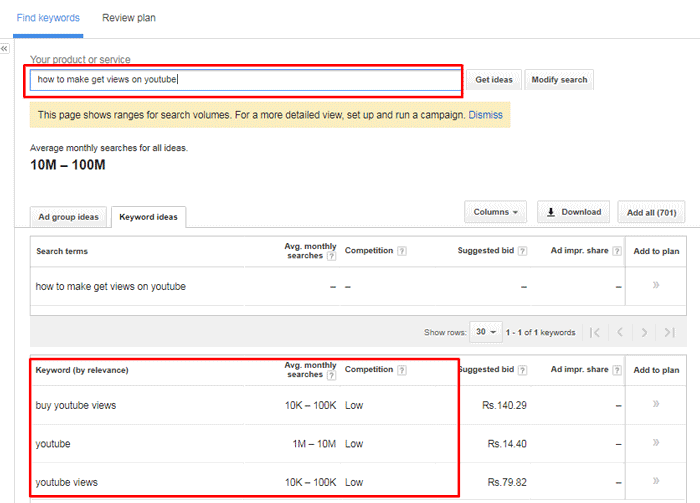 But if used properly, Google keyword planner can turn out to be a handy tool for Youtube Tags searching. To use this tool, all you need to do is to open keyword planner, search for the phrase you want tags for. And in no time, you will be provided with a long list of keywords along with their monthly searches. A proper keyword research is a thorough topic. But you can learn it with little practice. In fact, tools like Keywordtool.io, BetterWayToWeb etc. takes just a few minutes to fetch out amazing youtube tags. Even you have just started doing Youtube recently, you must have an idea about this tip. Using video specific and relevant tags helps a lot in Youtube search engine optimization and they bring the targeted audience to your video. Many people, in order to get their videos suggested in the sidebar, put misleading tags in their videos. This trick can get your short term views but it impacts wrong on your overall channel performance. By misleading tags I mean the irrelevant tags that have nothing to do with your video titles. Like if your video is about latest smartphone tricks, the tags should include the smartphone, smartphone tricks and so forth. But if you insert tags like PM speech 2017, it is considered to be a misleading tag. If by chance, someone who wants to see PM speech, reaches to your video by this keyword and if he sees the video content as the ‘smartphone tips and tricks’, he will opt out of your channel without watching the video. And if you have knowledge about Youtube SEO, you must know that Youtube watch time is yet another major factor for video ranking. So keeping the long term growth of your channel in mind, avoid putting the misleading tags and try using the video specific tags on your youtube videos. To keep up with the competition, you need to keep eye on what your competitors are doing! The Same thing is applicable on Youtube. In order to get more views on Youtube, you need to check out what tags are driving traffic to your competitors and then you can leverage the same keywords for your own. This is a very important SEO practice and if you learn this thing, you can easily dominate your competitors. Knowing a success strategy and then replicating it in a modifies yet better way assures great results. 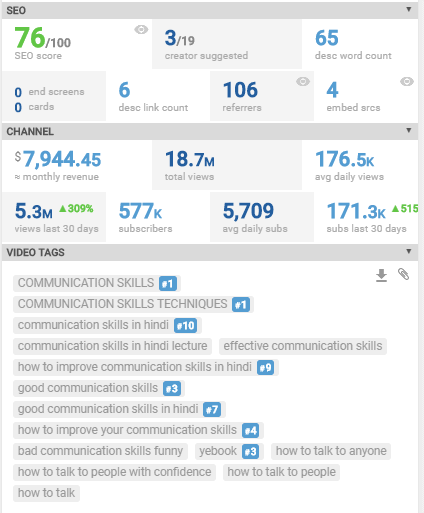 There are several tools like VidIQ and TubeBuddy which lets you view tags of other videos along with their ranking on search engine and other important data. In fact, you don’t need to put any efforts to view competitors tags once you install any of these extensions on your browser. I personally like VidIQ. See how the VidIQ result looks like. Yet another very important tip for driving more traffic to your youtube videos. You can add up to 500 characters as your Youtube tags. And by now you have understood that people reach out to your videos through video tags. So not to say, if there will be more tags, the probability of people reaching out to your video will be increased. Many youtube expert suggests that use only the necessary tags and no need to over use tags. But opposite to this statement, I will suggest utilizing all the 500 tagging characters. But remember, don’t spam any keyword. Add relevant and mix of long tail and generic keywords! I won’t say you completely need to avoid the Misspelled tags on your Youtube video! The Internet is vast and there are millions and billions of people who spell some terms wrong. If you want to get optimum results from your tags, try using those wrongly spelled words as your youtube tags. Ex. buisness, busyness etc. Because our major goal is to optimize our youtube tags such a way that they drive more views to our videos. So we need to target all the keywords that people search for regardless of the spelling they are using! Now let’s move further and check out my next tip on how to tag youtube videos. For proper tagging, you must include tags that are your brand oriented. Because everyone wants to get searched for their brand name or their channel name. So one of the important tip in how to tag youtube videos is to insert your brand specific tags in all your videos. So whenever anyone makes a search on youtube by typing your/channel name or your brand name, your videos and channel come on top. Along with your brand or channel name, make sure to add channel specific tags. Meaning, those tags that are broadly targeted by your channel. For instance, if your channel basically covers Youtube and technology videos, your channel specific keywords should be Youtube tips, technology tips, latest Youtube and technology tips and so forth. Instead of adding these tags manually all the time, you can set them as default channel tags. So that whenever you upload any new video on youtube, these tags get added by default in your video tags section! Updating tags according to the ongoing trend is one of the very important practices in learning how to tag youtube videos for more views. This is a very simple yet powerful tactic for Youtube tags optimization. All you need to do is just keep yourself up to date with whats trending and if you have already uploaded a video regarding that topic, just modify your tags and add those trending search terms. Many people neglect this SEO practice and don’t get appropriate results on Youtube! With this note, we are done with all the basic tips on how to tag youtube videos. If you take care of all these points, there is no looking back. And I’m sure you will experience rapid growth on Youtube like never before. But before we wrap up our article, let’s me give you a bonus tip! If you come to know about this below method, trust me, youtube tagging will become a matter of just a few clicks for you! I believe all the points mentioned above are enough for you to tag your Youtube videos in a right way. But this bonus tip will help you quickly find the most searched keywords on Youtube. Here we won’t be using any additional tool or software but Youtube search engine itself. Here’s what you need to do! Step 1. First of all, just head over to youtube. Or just click here. Step 2. In the Youtube search bar, type in the video title or phrase you want keywords for. For Instance, I’m typing the search quarry “How to make a paper flower”. But even before I complete typing the search phrase, I get provided with a list of suggested titles. See the screenshot below. As you can see the search suggestion I’m getting for the given phrase are “how to make a paper flower easy”, “how to make a paper flower easy step by step”, for books, for boutique and so forth. These suggested phrases are nothing but the highest searched keywords by the people on Youtube for that topic. Now without any much brainstorming, we can use these search terms as our video tags for getting more views. Step 3. But since these are long tail keyword and not all the phrases are relevant, I’ll pick up only the initial few phrases and will change the search quarry to get a few more amazing tags. For example, I change my search quarry to “Paper flower making” and see what results I get. Step 4. Now you need to take up the first few search terms and change the search query to get the more search terms. By this way, we quickly get to know about the terms people are using for reaching out to that particular video. But remember, these are long tails keywords and we can add only up 500 characters to our tags section. So be wise and choose only the relevant search terms which can drive views to your videos. If I had to choose tags for my videos, I’ll change the search phrase for 3-4 times and will use 1-2 search phrase from each suggestion and will mix it with more generic and short keywords. Youtube tagging is not a rocket science that can’t be understood. The real problem with newbie Youtuber is that they don’t really understand what are Youtube tags and why they are vital for ranking a Youtube video. Instead of learning details about how to tag youtube videos, people get panic and give up on youtube. Once the real meaning of Youtube tags and its relevance in Youtube SEO is understood, one can easily optimise their videos with best Youtube tags that can drive traffic and views to their videos. I’m pretty sure this tutorial was thorough enough to teach you almost everything about Youtube video tagging. And I hope all your doubts related to Youtube tagging is resolved. But if you still have any quarries remaining about how to tag youtube videos to get more views, feel free to ask me in the comment section below. I was fully unaware of YouTube tags. Now I know. Thanks for sharing. I wanted to know, is there any free Keyword Research Tool other then Adwords available for use? For example, for using Moz or Semrush as free, I need to register for 1st month as trial member but they need credit card info for that. Is there any site which I can use for same purpose without giving my card details? I must say this is the finest and easy but most powerful solution of making video tag for youtube videos. Users like me can learn to create tag easily now if they follow your steps. I like the misspelled tag method. I really didn’t know that method. Thanks for sharing this superb post. I want to know one more thing. Can I use TubeBuddy for free? If possible, please let me know the answer. Video marketing is one of the favorite ways to monetize my blog and its help me to make some money from my blog or website.